On April 23rd we lost our great companion, friend, security guard, and leftover food disposal, Nala. 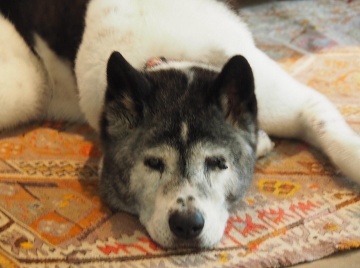 Nala was our second Akita, a great breed of large dogs originally from Japan. She was a more than worthy successor to Indiana, who also lived to the ripe old age of 14 (98 years old in dog years). From the first day we met her at the breeders in Channelview, we knew she was the pick of the litter with an expressive face and lots of personality. She was always ready to go on long walks, even up mountains in Colorado. She had freckles (spots) as a puppy and always had a very cute face. She was truly a beloved member of the family. When someone loses a "family" member pet, there is something missing, an emptiness, as a life intertwined with ones' own is gone. We are comforted that she had a great life and after all, all dogs go to heaven. One would expect President Obama's apologists to call the incredible acquisition of thousands of documents related to the Iranian Nuclear Weapons Program no big deal, but it is a monumental deal. The trove of 55,000 pages and 183 compact discs were taken from a warehouse in Tehran. So far, only a small portion has been revealed and more will be coming as it is translated and analyzed. Also significant, is that these documents existed at all and they were in a warehouse away from the eyes of the international inspectors. Observers realize that the reason the documents were hidden was to hide the military aspects of the nuclear program from the world. It's clear once again the agreement with Iran was a con game. It has resulted in an increasing chance of a major confrontation between Iran, the U.S and Israel. One wonders today what the heck did President Obama think he was getting? We at TCR give the City politicians credit, they are smart enough to know public safety sells to the voters. It is true the City of Houston has neglected police and fire equipment and personnel for years. What's interesting is even with a revenue cap, revenue to the City has gone up significantly since it was passed years ago. But here is where the rubber meets the road, the City has underfunded core areas like the police, firefighters and infrastructure in order to fund non-priority items like the million-dollar homework help line and an increasingly bloated city bureaucracy, among other things. First, the City needs to go to zero-based budgeting and reduce or eliminate non-core items and make the funds available for public safety. Second, the City has been down this road before, remember the infrastructure fee (aka Rain Tax?) As pointed out by experts, the funds raised have not gone 100% to flood projects and street replacement. In fact, a significant amount has been "given" to public works to pay salaries. As for flooding projects, not so much, and our streets are worse than ever. This money was supposed to be in a lock box, but the box had a back door. Third, this dedicated funds promise of full transparency and fund spending has now gone dark, as under Turner (unlike Annise Parker), transparency regarding the Rain Tax lock box money is gone. Visibility and how the Rain Tax money has been spent is no more! Hidden from view by the Turner administration. So to Mayor Turner we say, you haven't done what's needed to ask the voters to bust the revenue cap. After all, with the City's track record, why should you all be trusted? Harris County is looking to fund a monster bond package for regional flood control. There is no question we have many projects that need to be addressed or the flooding problem will persist. So we need to review the projects list and plans and make sure trusted experts agree it's a wise use of funds. Already there are some calling for fair share allocations, but fairness has zero to do with it. It's about the most bang for the buck. The required tax increase will be significant, all the more reason to ensure smart planning and that the county budget is likewise scrubbed for any non-core spending that could be reallocated, reducing the size of a required tax increase. Doing nothing is not an option. Doing things in an intelligent and cost effective way is essential. The Commissioners deserve credit for planning for solutions and not waiting for "someone else to take care of it," because that won't happen. State of Houston - 2018 Kinder Institute for Urban Research Survey findings with Guest: Dr. Stephen L. Klineberg, Founding Director of the Kinder Institute for Urban Research. Gary Polland is a long-time conservative and Republican spokesman, fund-raiser, and leader who completed three terms as the Harris County Republican Chairman. During his three terms, Gary was described as the most successful county Chairman in America by Human Events - The National Conservative Weekly. He is in his twenty-first year of editing a newsletter dealing with key conservative and Republican issues. The last seventeen years he has edited Texas Conservative Review. As a public service for the last 15 years, Gary has published election guides for the GOP primary, general elections and city elections, all with the purpose of assisting conservative candidates. Gary is also in his 15th year of co-hosting Red, White and Blue on PBS Houston, longest running political talk show in Texas history. Gary is a practicing attorney and strategic consultant. He can be reached at (713) 621-6335.